This book is about is more than a subdiscipline within the field of economics---it is about a new field named "public choice political economy" that gradually evolved during the 1970s and 1980s at Virginia Polytechnic Institute in Blacksburg, Virginia. What is the field Public Choice Political Economy all about? How did it originate? Who were the main architects and builders? What values and work habits motivated the work? Finally, how did the facts about the development of public choice political economy stack up against what we know about science in general and how it has developed? 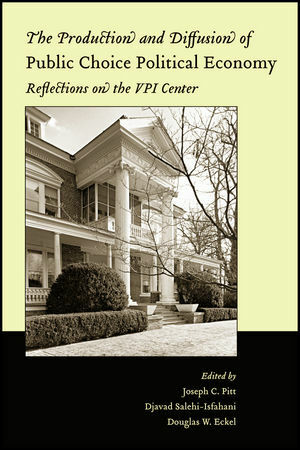 The authors of the essays included in this volume, originally came together in May of 2000 in Blacksburg to celebrate their scientific achievements and take pride in the regimen of research and the processes that brewed at the legendary Public Choice center in Virginia. This location provided what turned out to be a fortuitous combination of obscurity and rustic quiet for original thoughts and concentrated debates. Inspired by the pioneer attitudes of the Virginians and the dedication and work ethic of James Buchanan and Gordon Tullock, a core group of renegade social scientists broke new ground and started a revolution in thought. The big questions about economizing behavior, constitutional limitations on an overreaching bureaucracy and the possible design and redesign of institutions to harness self-interested behavior for the benefit of all are touched on and placed in historical context. The resulting public choice movement occurred first in economics and later extended to political science and beyond. This may have been one of the most important developments in twentieth century social science. The book concludes with Nobel laureate, James Buchanan's thoughts about what had transpired largely but not exclusively under his guidance. Other contributors include, Richard B. McKenzie, Geoffrey Brennan, Stephen Medema and Robert Sugden. Professors Pitt, Salehi-Isfahani and Eckel provide a useful introduction to this collection.These essays and comments were originally published in The American Journal of Economics and Sociology in January of 2004 as an "invited volume." The book should be of great interest to historians of economics and the social sciences. Joseph C. Pitt is a Professor of Philosophy and Head of the Department of Philosophy at Virginia Tech. Djavad Salehi-Isfahani is a Professor in the Department of Economics at Virginia Tech. Douglas Eckel is Assistant Dean in the College of Arts & Sciences and an Instructor in Political Science at Virginia Tech. He teaches in the areas of Public Administration and Urban Politics. Joseph C. Pitt, Djavad Salehi-Isfahani, Douglas Eckel . Life in the Putty-Knife Factory!. Commentary on “The Quest for Meaning in Public Choice” by Elinor Ostrom and Vincent Ostrom. Bargaining with the Devil: Commentary on the Ostroms’ “Quest for Meaning in Public Choice”. Scientific Progress and Lessons for Institutional Design: Comments on “A Toy Model of Scientific Progress” by Suzanne Lohmann. Comments on McClennen’s “Prudence and Constitutional Rights”: Or How Do You Turn Words Into Action?.